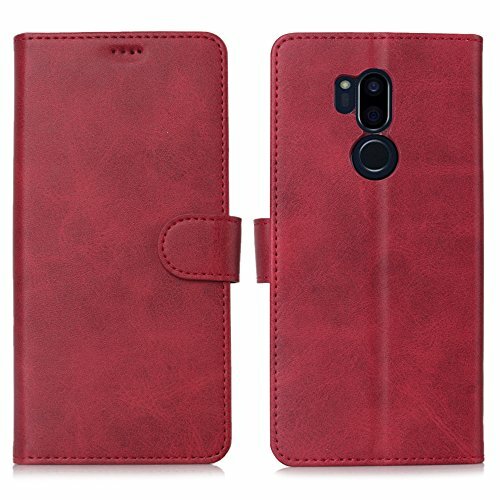 LG G7 Case/LG G7 ThinQ Case, Cress [Slim Fit] [Stand Feature] Flip Leather Wallet Case With Card Slot Magnetic Closure Bumper TPU For LG G7 (Red) by Cresee at Got Busted Mobile. MPN: CR-HH-G7-red-IN. Hurry! Limited time offer. Offer valid only while supplies last. LG G7 Case About Cresee: Cresee is devoted to the design philosophy of popularizing elegance, superior workmanship and simple but classic styling. Cresee is devoted to the design philosophy of popularizing elegance, superior workmanship and simple but classic styling. Less is more,you are worth it! √Compatible with LG G7. Rich in colour and well made. √Produced with environmental protection material, soft TPU & PU leather. Give you a total different view when comparing with other case on the market. √After-sales service, if you think there is something wrong with the product, please send an email to us, we will reply you in the shortest time, thank you! We are committed to customer satisfaction 100%.Our customer service team will gladly, any inquiry or questions please feel free to contact us.We respond to all emails within 24 hours. All customer interactions will be handled in a professional and expedient manner. MATERIAL: Premium PU leather cover guards your device against scratches and drops. The durable soft TPU full-body inner case comes with cushioned shockproof edge and ensures your phone against drops and bumps. EXQUISITE：Beautifully packaged in Cresee gift box, a good choice for yourself or your beloved one. SERVICE：100% Money Back, 1 year Warranty for any Quality Problem. Lifetime Customer Service.Your satisfaction will be my greatest achievement,Thank you.SERVICE：100% Money Back, 1 year Warranty for any Quality Problem. Lifetime Customer Service.Your satisfaction will be my greatest achievement,Thank you. If you have any questions about this product by Cresee, contact us by completing and submitting the form below. If you are looking for a specif part number, please include it with your message.